Many people struggle with tooth loss, which impacts your oral health and confidence in your smile. In the U.S. alone, there are 120 million people missing one or more teeth, and waiting to address the issue will end up causing you to lose even more teeth. There are several options for replacing missing teeth, but our dentists often recommend dental implants due to their quality and durability. We provide the highest standard of care and favor those services that offer the longest-lasting and most reliable results. During your initial consultation with Dr. Rowe or Dr. Baltz, we will carefully listen to your concerns, provide an assessment of your oral health, and give you honest and useful information about your restoration options. If you have suffered tooth loss, please contact Highpoint Dental Care in Aurora today at 303-617-9100 to schedule your free dental implant consultation. 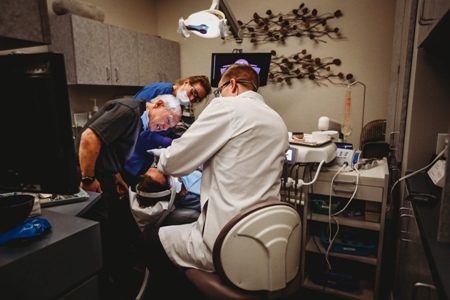 Our implant dentists serve patients throughout Colorado including Aurora, Parker, Green Valley Ranch, and Centennial. How Long Until I Have My Artificial Teeth? Why Choose Our Dentists at Highpoint Dental Care? Tooth loss does more damage than you may realize. It is often caused by aging, poor dental hygiene, or a mouth injury. While most of our patients are concerned about the cosmetic aspects of missing teeth, tooth loss can cause a host of other problems. The longer you wait to have a restorative dentistry procedure such as dental implants or even just dentures, the more missing teeth wreaks havoc on your oral health. Resorption sets in quickly which is the breakdown of your jawbone, causing your face to change shape and putting your existing teeth in jeopardy. The length of time between tooth loss and restoration with an implant also impacts your eligibility. We need a healthy jawbone and gums free of disease to begin the implant process. Shifting Teeth: Your remaining teeth will begin to shift to fill the gap left by the missing tooth. Over-eruption of the teeth opposing the lost tooth will also occur, causing further crowding and crookedness. Difficulty Eating & Speaking: Chewing will likely become difficult the longer you wait to have dental implants. Your ability to eat and speak will change as well as alteration in your facial shape. Stress of Existing Teeth: Your bite will also alter, putting more stress on your remaining teeth when you eat and speak. If you have a tendency to clench or grind your teeth, this stress will increase. Additionally, you may not qualify for dental implants if you clench your teeth. However, this can be helped with a mouth guard used at night. TMJ Disorders: When your bite and tooth alignment changes, you may develop TMJ dysfunction. Your temporomandibular joints (TMJ) are located on either side of your jaw, and any modification may cause pain, a clicking or popping jaw, tinnitus (ringing in the ears), and many other side effects. Bone Resorption: Bone loss sets in quickly after tooth loss due to a lack of pressure from biting and chewing. Within one year of losing the tooth, you may lose up to 20% of your jawbone density, and the longer you wait to restore the missing tooth, the less likely you’ll qualify for dental implants. Further Tooth Loss: Bone resorption puts your remaining teeth in danger as well. Between losing the tooth (or teeth), shifting of your existing teeth, and loss of bone density, you are more likely to lose more of your teeth over time. Change in Facial Shape: The loss of jawbone density also impacts the side profile of your face. You may look older and have a tired, “sagging” appearance. Dental implants have an array of perks for our patients. The most notable is the durability of the implant. These artificial teeth are just as strong, if not more so, as your natural teeth and aren’t susceptible to infection, eliminating the risk of cavities. You also don’t have to worry about your implant coming loose during your day-to-day activities and when you eat. Dental implants are built to last, making them cost-effective and allowing them to protect your jawbone from resorption. Your facial shape is restored by dental implants along with your speaking, biting, and chewing capabilities. You may not qualify for dental implants if you have irreversible gum disease, osteoporosis, or clench and grind your teeth. Our dentist can determine if dental implants are right for you during your initial consultation at Highpoint Dental Care in Aurora. We will discuss your available options and decide the best way to give you a stunning smile. Dental implants involve a metal post, an abutment, and a dental crown. The process begins with a thorough exam and consultation, followed by an impression mold of your teeth. The mold helps our technicians to create an artificial tooth in our dental lab that matches the size, shape, and shade of your remaining teeth. If you’d like whiter teeth, we can perform teeth whitening treatments prior to your dental implant because crowns can’t be bleached. The metal post is implanted under your gums in the jawbone located in the gap left by your missing tooth root. After several months, your bone and the implant post fuse together, creating a strong root system. Dr. Baltz or Dr. Rowe will then screw in the abutment, which connects the post to the dental crown, which can be made of steel, ceramic, metal or gold. We typically recommend ceramic as it looks like your natural teeth. The crown is placed at the gum surface, and you can care for your dental implants the same way you take care of your existing teeth — daily brushing, flossing, and rinsing. It’s essential for you to take good care of your natural and artificial teeth for many reasons, but especially because gum disease and tooth decay can endanger your entire smile. The first step of the dental implant process requires the longest recovery time. Once the metal post is secured in your jawbone, we must wait for the natural fusing of the metal and bone. We need a strong artificial root and bone connection before continuing with the abutment and crown. This part can take several months. Our patients in the Aurora area typically have their full restoration in 3-4 months. Dental implants range from $1,500 to $6,000, which includes the actual implant surgery, metal post, the abutment, and the dental crown. The price of your dental implants will depend on several factors such as the material used to create the crown and the number of missing teeth. We offer a free consultation for dentistry procedures of this magnitude and can give you a better idea of the cost of your dental implants during your initial appointment. If you’re concerned about the price, you may want to consider dentures in the meantime. The longer you wait to restore your missing tooth, the higher the price. The risks associated with tooth loss we discussed above such as tooth shifting and bone resorption will require more extensive dental restoration in the future. That’s why we recommend starting the implant process as soon as possible. Highpoint Dental Care provides a non-threatening, welcoming environment, so our patients of all ages feel comfortable and well cared for. We perform all procedures and treatments in-house, making it easy to have your cosmetic and restorative procedures. Skilled and experienced, our dentists hold the comfort and satisfaction of each patient as top priorities and make every effort to ensure our implants and restorations provide long-term function and beauty. 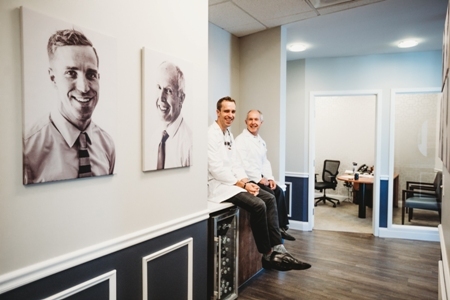 Dr. Baltz and Dr. Rowe offer a fun atmosphere, which eases dental anxiety and a strong doctor-patient relationship from the start. We serve several generations of families in the Aurora area, which shows how much our patients trust our expertise. If you are anxious about receiving dental implants, we can discuss sedation options, including free nitrous oxide, which can help quell discomfort. You will receive high-quality care starting with your consultation and initial exam. We are a proud family dentistry practice and believe in full transparency when it comes to the price and process of dental implants and other dentistry services. Our dentists do a “show and tell” to make sure you understand how your procedure is performed. Your treatment plan will take into consideration your aesthetic goals for your smile, how we’ll accomplish them, and the total cost to you. If you’re missing one or more teeth, please contact our experienced dentists at Highpoint Dental Care in Aurora today at 303-617-9100 to see if dental implants are right for you. 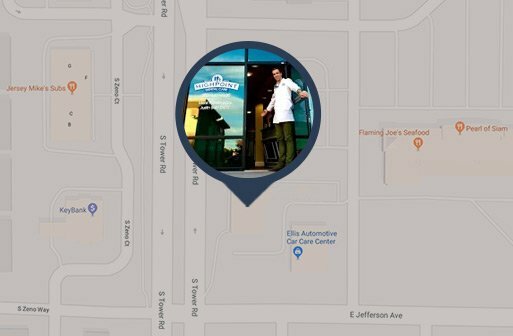 We provide cosmetic, family, and restorative dentistry to patients in the Aurora, Colorado area including Parker, Green Valley Ranch, and Centennial.